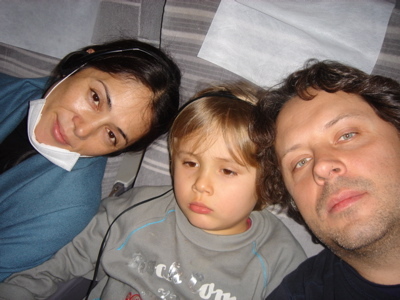 4/24/2019 12:06:11 AM - July 19-20, 2006 (Wed-Thurs) -- The 3 of us set off for Japan. Somehow the trip seemed ultra long this time. Sasha noticed we were flying further Northwest before heading south into Japan which seemed to have elongated the flight another half hour+. JAL economy seats allow very little leg room, especially when the passenger in front reclines; even Nikita was uncomfortable. Truly packed like sardines. For some reason I kept hearing "All We Need Is Love" by the Beatles in my head the entire trip, out of no where. Coincidence or not, the hotel we were staying at, the Capitol Tokyu, had pictures of the Beatles in their lobby commemorating their first visit to Japan and stay at the hotel in 1963. Sadly, the hotel is scheduled to be torn down in November. I have a lot of nostalgia and history attached to the hotel, including the day I first met Sasha when we'd all stayed at the Capitol the night before we headed for Madarao for the Newport Jazz Festival. We had dinner at our favorite place near the hotel, an "izakaya" that has all kinds of great Japanese dishes and sake. July 21, 2006 (Fri) -- The usual jetlag scenario -- I got up at 2:30 a.m., then Nikita at 3:00 a.m., with Sasha screaming, theatening and terrorizing Nikita 'til he fell back asleep, sobbing, at 4:00 a.m.; poor thing. We all got up at 6:30 a.m. Weather's much cooler than in New York. We'd left a 100 degree heatwave to the still rainy season in Japan. I had a few radio interviews throughout the day, one with a good friend, Lisle on her show on InterFm, and a couple for FM Tokyo. We got back to the hotel in time for dinner with Henry, who'd just arrived. It's become tradition for Sasha and whoever is in the band to go to Tsukiji for sushi at one particular place that specializes in maguro (tuna), and this time Nikita and I joined along with my friend Yuki (who always helps with Nikita when I'm in a crunch for someone to look after him during my performances) and his wife -- the lady he'd been dating when we saw him last in March, Masayo, and he got married recently and is expecting their first child! I'm really happy for them, especially for Yuki who is like a little brother to me. We got to sleep at midnight, sushi and sake still in our tummies.